Geospatial education is experiencing a new age of challenges and opportunities. Demand for a spatially aware work force remains strong, and the constant evolution of the geospatial domain provides an imperative for lifelong learning. To meet these challenges, geospatial educators are developing new approaches for teaching, ranging from intensely individualized lab experiences all the way up to Massive Open Online Courses (MOOCs), which reach thousands at a time around the world. While there is much promise in both the needs we face, as well as the means we have to meet it, there remains a critical challenge to appropriately design geospatial education experiences to reach their full potential in terms of quality, value, and access. Who is the audience that will be using the map? What is the output format for the map? In my view, the problem of designing effective geospatial education experiences can be seen through a similar lens. As our domain experiences rapid change through pressures imposed by new technical paradigms, new areas of focus for geospatial analysis, and new types of educational experiences, it is time for us to rethink the purpose of geospatial education, the learners we intend to reach, and the ways in which we engage with those audiences. While debate continues among educators and professionals regarding what ought to constitute a rich and rigorous geospatial education, there are three key areas of overlapping needs that all learners share. Learner success in our discipline depends on achieving the right blend of core geospatial competencies, technical skills, and analytical practices grounded in real-world problems. 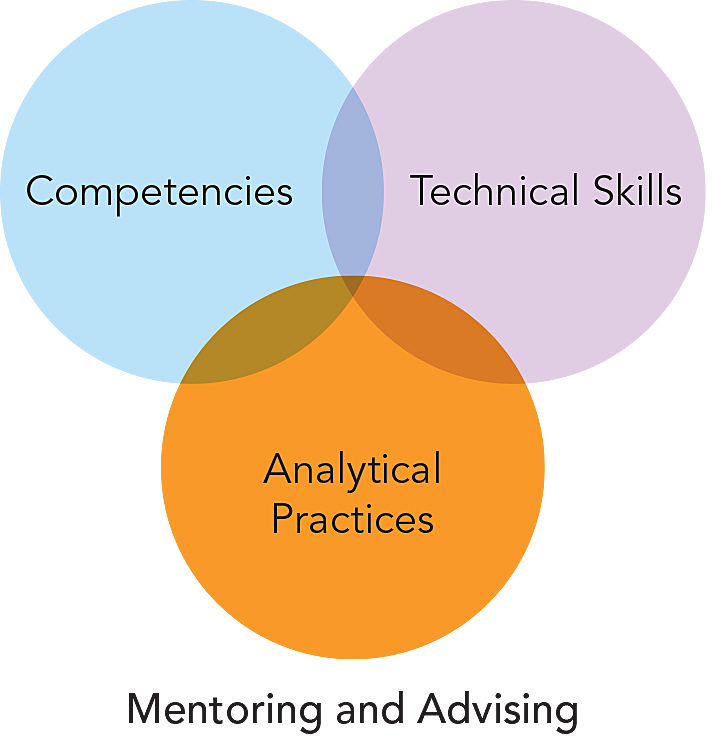 And each of these three areas is synthesized by mentoring through professional and academic advising. Much effort has been made in recent years to develop and share collections of core competencies for geospatial professionals. The GIS&T Body of Knowledge (2006), offering more than 1,600 educational objectives, is now undergoing revision for its second edition and is expected to cover a broader range of areas than the original. The US Department of Labor has sponsored the development of the Geospatial Technology Competency Model (2010) and, more recently, the Geospatial Management Competency Model (2012) to describe core competencies for geospatial professionals, and the former model is now under further development. These resources provide important scaffolding for use in the development of new courses and the revision of existing curricula. Learner success depends on achieving the right blend. As nice as these basic competency sets are for setting the scene, they (rightfully) eschew much of the technology-specific capabilities that we expect learners to have in order for them to enter the work force. Academic purists will say that so long as a learner demonstrates core competencies, they will adapt just fine to whatever technology comes next. Employers, meanwhile, will often ignore submitted resumés that show no expertise with common and emergent industry technologies. In higher education, it remains a serious challenge to develop and sustain high-quality courses that introduce relevant contemporary technologies and best practices in the context of learning about core competencies. What should make it possible to achieve both goals is to focus on the contexts of geospatial work—analytical practice that is grounded in real-world problems. Core competencies taught in a vacuum are unlikely to engage learners. Technology training alone is not sufficient to develop critical spatial thinking skills. The most positive synthesis of all three key elements comes when the focus of geospatial education is on solving relevant, real-world problems that require one to bring together technical skills and core competencies to actually achieve something. The way this combination can come to life for geospatial educators is through the deliberate evolution away from curricula centered on generic classes like Introduction to GIS and Advanced Spatial Databases toward courses that provide similar underpinnings in the context of problems that actually matter, like Understanding Disasters Using GIS or Geodesign to Improve Public Spaces. Instead of thinking of these application courses as mere electives that learners take long after they have made up their minds to study geography, we could begin to think of those grounded-learning experiences as parts of a new core for our learners from the very start. The ways in which we engage with learners have changed dramatically in recent years. While distance education has precedents all the way back to surface mail correspondence courses, today’s technologies make it possible to engage with learners on mobile devices and through web-based class experiences that challenge the established norms of same-time, same-place educational interaction. Learners have high expectations for us to develop flexible courses of study and to use flexible modes of engagement to access course content and interact with instructors. All the while, the potential audience for our courses has become far more diverse in terms of age, experience, and global reach. At Pennsylvania State University, the vast majority of resident undergraduate students now take fully online or blended online/classroom courses as part of their normal semester course load. At the same time, the fastest-growing student population for us is our fully online cohort through Penn State World Campus. New educational paradigms, such as the MOOC, provide students with minimal barriers to entry and challenge instructors to develop content and assessments that will scale to tens of thousands of learners around the world. Geospatial education can (and already does) take place in each of these modes of learner engagement. One challenge for us is to determine which instructional modes match well with particular pieces of the geospatial education experience. For example, my experience with teaching an MOOC on mapping leads me to believe that such courses will work well as teasers to draw new people into our discipline and get them up to speed on the basics but that MOOCs would not be good for tackling higher-order educational goals, such as the iterative refinement of a learner’s cartographic design skills. In addition to diversification in the ways we teach, what defines a student today is also increasingly hard to generalize. In the engagement types I reference above, students may include traditional 18- to 21-year-olds taking blended courses on campus, midcareer professionals taking fully online programs while working full time, and retirees who are exploring a topic for the first time in the form of an MOOC. Each of these groups can also be globally diverse. In the MOOC I taught, about 70 percent of the students enrolled came from outside the United States. In teaching students across the spectrum of age, background, and geography, it has become clear to me that we need to be much more explicit when we talk about designing classes and curricula to support students. We have to design geospatial education around which student cohorts we are trying to serve and to respond to their unique needs. The good news is that we have a problem serving so many different types of people with quality geospatial education. Many other disciplines wish they had this problem. The bad news is that when we try to meet these needs today, we are often held back by inflexible legacy policies and frameworks that overlay our teaching. For example, credit hours are an antiquated way to measure the achievement of our learners. Schools like Western Governors University and the University of Wisconsin are using competency-based models in place of credit hours to certify that their graduates have demonstrated abilities in key areas of expertise in their field. There is also a wide range of new approaches for educational badging to show mastery of skills and methods regardless of where those skills have been obtained. Whether or not badging and competency-based models become commonplace is not clear, as both methods have their own limitations. What seems clear to me, however, is that the future of geospatial education will require flexible views of what constitutes a course, what types of educational attainment will matter when one looks for a job, and in which life stages we expect learners to seek education. And yes, we can also expect there will be major changes in who is considered an educational provider. Students are already learning from each other through peer exercises in classes of all sizes, and professional expertise is increasingly valued in educational contexts, signaling a shift away from a value system that places formally trained educators at the top for every learning context. It is hard to envision a future 15 years from now where most geospatial education happens when you are 18–21 years old, is delivered only in a physical classroom under the auspices of a traditional institution, is provided in semester-long chunks measured by the hours in which you spend taking that class, and is only auditable via a short title and letter grade on a paper transcript. On the flip side, it is very exciting to imagine a future where geospatial education happens throughout your entire life, using a variety of modes, and is auditable based on the problems you are actually capable of solving. If the status quo in geospatial education is akin to command-line, desktop GIS software with a narrow user base, the future could be its web-based, scalable counterpart that is usable by everyone. Dr. Anthony C. Robinson serves as the lead faculty for Online Geospatial Education programs and assistant director for the Department of Geography’s GeoVISTA research center at Pennsylvania State University. Robinson directs Penn State’s Online Geospatial Education efforts, including its master of GIS and postbaccalaureate GIS certificate programs, which have served more than 5,000 students since 1999. Robinson teaches Maps and the Geospatial Revolution on Coursera, an MOOC that is now open for enrollments for its second offering beginning on April 30, 2014. 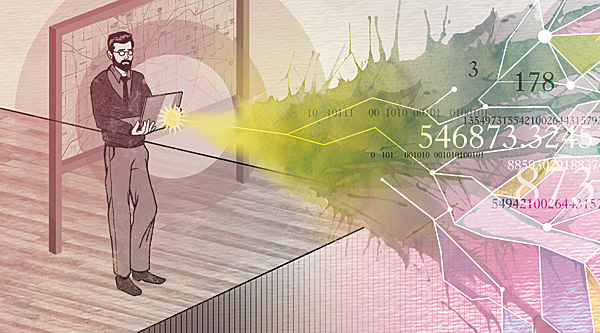 For the GeoVISTA Center, Robinson’s research focuses on the science of interface and interaction design for geographic visualization software tools. He has developed interface design and usability assessment methods for integrating geographic visualization tools with work in epidemiology, crisis management, and homeland security. For more information, contact Anthony Robinson.